To say not all memory care communities are alike is an understatement. And those differences are also a big part of what makes it so hard, and confusing, to find the best fit for your loved one. While your family is the only one who can ultimately make that decision, we can help you understand the philosophy behind purpose-built design and how it can benefit your loved one. Memory care nurtures those with Alzheimer’s disease and dementia through specifically trained staff, individualized support and 24-hour assistance. 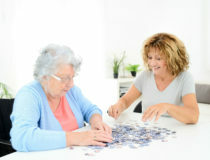 What Can I Expect From A Memory Care Community? How Is Purpose-Built Design Defined? Beyond the traditional offerings, a community with a purpose-built design, such as Sonata’s Serenades Memory Care, features a neighborhood concept with open floor plans and design elements that include color-coding and cueing. These features are deliberately chosen to be secure and to allow for easy orientation so residents can confidently navigate their home and outdoor spaces, and at the same time enjoy a sense of freedom, while ensuring their safety. In addition, features such as special lighting to reduce glare as well as anxiety in residents. 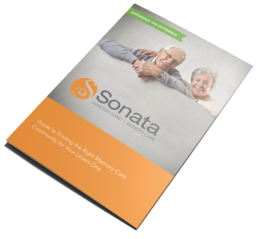 Why Does Sonata Use A Purpose-Built Memory Care Design Approach? Sonata’s philosophy across all of our senior living communities is to help residents retain their independence and sense of self for as long as possible. To do that, we create a hassle-free, vibrant lifestyle for each resident by blending signature programming, cutting-edge technology, a commitment to compassionate care and best-in-class customer service. Honoring this promise of individuality and independence was a special challenge when building our Serenades Memory Care communities. 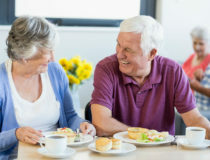 They had to be unique, like our residents, as well as secure, highly-functional and homelike, providing a welcome alternative to traditional memory care facilities in Central Florida. A purpose-built design allowed us to do just that. How Does Purpose-Built Memory Care Design Come to Life? Thematic neighborhoods: Provide visual cues that help residents navigate easily. Quiet “Reflections” room: Provides residents a place of tranquility and privacy. Internal access: With paths from each neighborhood, visiting is safe and easy for residents. Multipurpose areas: Offer a variety of social opportunities for individuals and small groups. Family rooms: Give residents space to visit with their relatives, neighbors and friends. Relaxing fountains: Create a soothing atmosphere with water displays and garden ornaments. Front porches: Reinforce a homelike feel and encourage socialization in each neighborhood. Serenity courtyards: Access to the outdoors fosters a sense of freedom for residents. Butterfly gardens: Connect residents with the beauty and serenity of nature. Beyond Purpose-Built Design, What Makes Serenades Memory Care Stand Apart? Programming: Our Live It Up!℠ program nurtures the International Council on Active Aging’s seven dimensions of wellness and combines them with renowned dementia care expert Teepa Snow’s Positive Approach™ to Care. This allows us to offer countless combinations of stimulating activities to help residents maintain their abilities and enhance their quality of life. Person-directed care: Reassuring those with Alzheimer’s and dementia that they’re cared for and respected as individuals is vital to their sense of belonging, confidence and happiness. We do that through personalized care plans and consistent daily routines that residents can count on. Partnership with families: Residents’ families are our families, too. Not only is involvement in their loved one’s care vital, our inviting neighborhoods – complete with resource library, dining and gathering areas and an outdoor playground – encourage positive, meaningful visits from family and friends of all ages. In fact, our Serenades Memory Care model has received back-to-back Best of the Best awards from the Assisted Living Federation of America (now Argentum) for our purpose-built design, person-centered care and programming. For more information on Sonata’s Serenades Memory Care, call a community near you today or schedule a visit.